This Japanese brand name was applied to several different models of electric mandolins built at a factory outside Tokyo. Because of its longer scale length, the Kent 744, the solidbody pictured above, is sometimes mistaken for—or tuned as—a mandola. As you can see above, it was offered in sunburst, cherry, blond, and white, and like all gentlemen, I prefer blonds. (It's my strong suspicion that the black 744 to the right has been refinished.) Heck, there was even a Kent 744 lefty. Below are three examples of the Kent 836, the odd "violin-shaped cutaway" model from the 1967 catalog. What were they thinkin'? Since we know that it exists in blond, sunburst, and red, it's reasonable to assume that there are white ones as well, but I have yet to see one. Below that are some examples of more generic-looking e-mandos with the Kent brand. The KayKraft copy with the white pickguard is from the early 1960s, and it's reasonable to assume that the other instruments in that row are of similar vintage—i.e., before the more distinctive 1967 designs were developed. That KayKraft model sports an Italian-built Eko pickup, but the proprietary pickups on the later models are considered quite collectible by those who collect pickups. 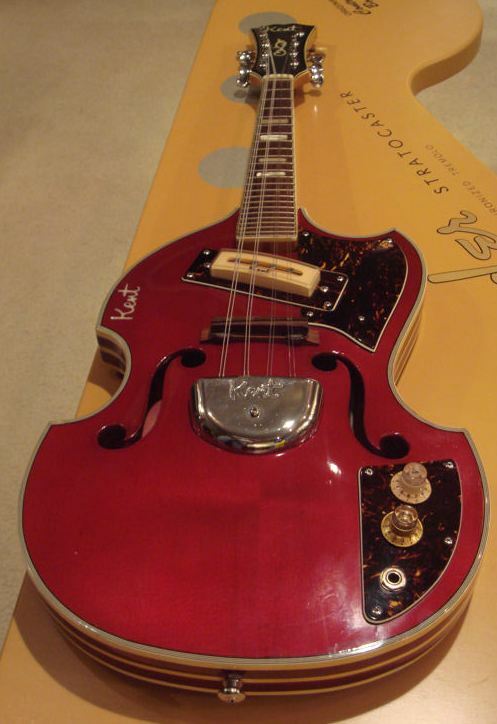 There was even an after-market Kent mandolin pickup similar to the DeArmond. Bluegrass great Jesse McReynolds reportedly did some recording with a Kent electric mandolin. For more info about Kents, visit Bob Gatewood's Kent collection page. For other examples of Japanese e-mandos, see Kingston, Conqueror, Bruno, and San Remo. 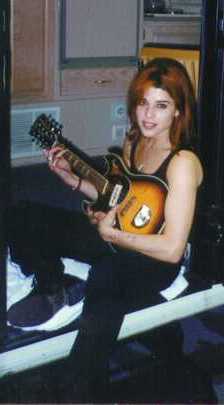 Lefties: Yes, indeed, it's Hollywood star Neve Campbell with a left-handed Kent electric! I'm sorry to inform you that the instrument she's holding belongs to Cleveland musician Bob Gatewood. Ms. Campbell doesn't, as far as I know, play the electric mandolin. But wouldn't it be a scream if she did?